There are an estimated 16 million Americans who suffer from the signs and symptoms of rosacea, with millions more in temporary remission. The skin condition involves the swelling of the veins under the skin which produce a red rash. The chronic inflammation affects the cheeks, nose, chin and forehead. Pimples and pustules may also occur, and in some patients, enlargement of the oil glands of the nose results in enlargement of the nose, or rhinophyma. The providers at Blue Ridge Dermatology are experts in the diagnosis and treatment of rosacea, as well as support for those who suffer from this condition. 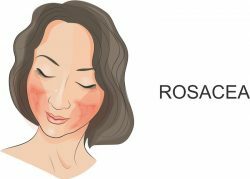 Rosacea often begins with a tendency to blush or flush more easily than other people, but the redness will slowly spread beyond the nose and cheeks to other areas of the face. Due to the variety of signs and symptoms, rosacea is categorized by four subtypes. Eythematotelangiectatic rosacea: This type is marked by redness, flushing and visible blood vessels. Papulopustular rosacea: In addition to redness, symptoms of this type include swelling and acne-like breakouts. Phymatous rosacea: Those suffering from this type experience thickened skin with a bumpy texture. Ocular rosacea: This type results in symptoms primarily in the eye area. The eyes may appear red and irritated, eyelids can be swollen, and a person may have what looks like a sty. With time, all types of rosacea often see permanent redness in the center of their face. Rosacea is most common in adults over 30. The causes are not fully understood but may be genetic or due to high levels of certain peptides and enzymes in the blood stream. Some research suggests that rosacea outbreaks may be influenced by bacterial proliferation in the small intestine. Other: skincare products, medications such as topical steroids, some blood pressure drugs, and some opiate painkillers. There is no clinical test to definitively diagnose rosacea. A physician will examine a patient’s skin and ask questions about symptoms and triggers. If you are unsure of potential triggers, he or she may ask you to keep a diary then follow up with a second appointment. The presence of enlarged blood vessels allows the physician to distinguish it from other skin disorders. Oral medication: Certain antibiotics can help reduce some types of bacteria, but may be prescribed to reduce inflammation. For acne-like rosacea symptoms, an oral acne drug may be recommended. Topical treatment: Depending on the symptoms, there are a variety of topical creams, lotions and serums that can help relieve the symptoms of rosacea. These treatments contain anti-inflammatory and antibacterial qualities. A physician may also recommend skincare products, like moisturizers and cleansers, to use as part of your daily skincare routine. Therapies: Laser therapy may help reduce the redness caused by enlarged blood vessels. Other options also include intense pulsed light therapy or photodynamic therapy. For more information about rosacea, or if you think you may be suffering from a skin condition, request an appointment with one of the skin specialists at Blue Ridge Dermatology. Our licensed dermatologists will evaluate your condition, help to identify your triggers and advise a treatment plan to manage your symptoms.